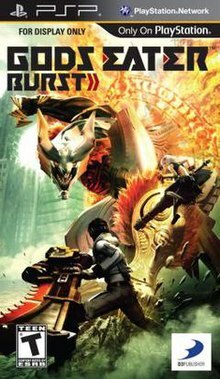 God Eater (ゴッドイーター, Goddo Ītā) is a 2010 action role-playing game for the PlayStation Portable, developed and published by Bandai Namco Entertainment in Japan. Gods Eater Burst (ゴッドイーター バースト, Goddo Ītā Bāsuto) is an enhanced re-release that expanded the story and introduced new game mechanics. Burst was the version that was localized and published by D3 Publisher in regions outside Japan; it was released in Japan on October 28, 2010, in North America on March 15, 2011, and in Europe on March 18, 2011. A sequel, God Eater 2, was released in Japan in November 2013. An anime television series based on the game, also called God Eater, was released by Ufotable in 2015. A remaster of Gods Eater Burst for the PlayStation 4 and PlayStation Vita, titled God Eater Resurrection has been released on October 29, 2015 in Japan. It was released in Western territories in summer 2016 with North American and European divisions of Bandai Namco Entertainment publishing the game on PlayStation 4, PlayStation Vita, and Microsoft Windows. Gameplay of Gods Eater Burst. God Eater is an action role-playing game in which players take control a young New-Type God Eater; special warriors dedicated to defeating monstrous enemies known as the Aragami (荒神, "violent god"). God Eater offers mission-based single-player mode in which consists over 100 missions. Co-operative play of up to three teammates over local adhoc wireless multiplayer or AI-controlled teammates. The North American version of the game also supported the PlayStation 3's adhoc Party. The game features character creation allowing customization of hair style, hair color, face, skin color, clothing, and voice. The goal is to defeat all or specific Aragami in the designated area within the time limit depending on mission objectives. Additional rewards are gained depending on how efficiently the mission was completed. Players can dash, sprint, and jump by consuming stamina (ST) that auto-regenerates over time. Players' sole weapon is the God Arc (神機, Jinki); a unique weapon that can instantly switch to four different forms: Blade, Gun, Shield and Predator. Attacking Aragami in Gun form consumes Oracle Points (OP). Oracle Points can be regained by successfully attacking in Blade form, however this also consumes stamina. Once an Aragami has been defeated, materials can be collected from its remains by switching to Predator form and devouring it. If a player loses all of their health points (HP), AI teammates can use "Link Aid" to revive team members by sacrificing some HP of their own. By devouring an Aragami that is still alive, God Eaters obtain an Aragami bullet that can be fired back and temporarily enter a state called "Burst Mode" in which their speed, strength and energy regeneration increase. In addition, New-Type God Eaters can send teammates into an artificial Burst Mode called "Link Burst" by sending Aragami bullets at their teammates. The Link Burst is capable of "stacking" up to three times by receiving multiple Aragami bullets in succession. Players can upgrade, enhance and craft Blade, Gun, Shield, Upgrade Parts for their God arc using materials primarily found in missions. Gods Eater Burst introduces a new equipment part called the Control Unit which bestows different abilities to the user when in Burst Mode depending on the Unit equipped. God Eater Resurrection adds new and basic GE2RB updated features, one noticeable new feature is Predator Style which replaces the previously occupied Control Unit equip slot. It introduces a variety of new devouring moves such as various aerial devours, combo devours, step devours. Additionally quick and charged devour can be changed with various other devours unlocked throughout the game. These devours can be further enhanced by the addition of various buffs, which are ranked from 1 to 3 depending on how useful they are (Devours have ranks too, from 1 to 3, the bigger the rank, the longer it takes to devour, but gives ability to choose better buffs) such as HP healing, Instant level 3 burst, etc. An updated feature from GE2 allows players the optional use of an Operator in battle, who will notify the player of any newly emerging Aragami and give various status updates of players and NPCs in-battle. Another updated "Personal Abilities" given by the NPC characters (sometimes online players as well) which can provide various extra rewards or modify mission rewards. Selecting a NPC character's Personal Ability that has 3 'stars' filled on the upper right corner leads to a small post-mission cut scene giving more details about the characters. The updated game also adds 4 new weapons: Charge Spear, Boost Hammer, Shotgun, Variant Scythe. These weapons made their debut in Gods Eater 2 and Gods Eater 2 Rage Burst In total God Eater Resurrection has 14 difficulty ranks which divide the separate story arcs: 1-6 is the original story of God Eater, 7-10 is the story of Gods Eater Burst and 11-14 is new God Eater Resurrection story arc. Included with the game are also 2 Predator packs which are collections of high difficulty missions. The game is set in a fictional country named New Asian Union (NAU)[a] in the year 2071 where the world has been mostly destroyed by mysterious monsters known as the Aragami. An organization known as Fenrir was founded to exterminate Aragami using weapons called God Arcs which are made from the cells of an Aragami. Those who specialize in exterminating Aragami are known as God Eaters. Originally God Eaters had one type in which their God Arcs can only keep gun form or blade form, however a new type has been discovered that can switch between gun and blade form. Since then, they have been classified new-types and the previous as old-types. God Eater begins with the Protagonist joining Fenrir Far East Branch alongside Kota after discovering that the Protagonist is a new-type God Eater. The two are assigned under Lindow, leader of the first unit, in which he advises them not to die and to run when needed. He eventually meets more members of the first unit; Sakuya and Soma along with their instructor, Tsubaki. Dr. Paylor Sakaki teaches the new recruits about Aragami, and an initiative to expanding the arcology of the Far East Branch known as the Aegis Project. Soon after, a second new-type God Eater from Russia named Alisa joins the first unit. During a mission, a herd of Aragami ambush them which causes for Alisa to experience a psychological episode and accidentally trap Lindow. The rest of the first unit was able to escape, however Lindow was left behind. After they returned to the base, Alisa is immediately treated for her episodes and is temporarily removed from combat duty. The Protagonist visits Alisa when she is asleep and discovers an ability known as "resonance" where s/he can see ones memories by making physical contact. It was then revealed that her episodes are due to her childhood trauma of watching her parents eaten by an Aragami and the fact that she was hypnotized by her therapist. The Protagonist retrains Alisa the proper way of fighting, leading her to be able to returned to the front lines again. Meanwhile, Sakuya, after grieving for the missing Lindow, finds a secret message from him but is inaccessible without Lindow's armlet. After Lindow has been declared missing in action/discharged, the Protagonist is promoted as the new leader of the first unit by the director of the Fenrir Far East Branch, Johannes, who uses them in top secret missions looking for the entity known as the singularity. Sakaki, fully aware of the Director's intentions, deceives him into searching for the singularity in Europe after telling him that a mysterious Aragami appeared there. Sakaki was placed in command of the Fenrir Far East Branch temporarily until the director returned. Sakaki uses this time to send the Protagonist and the other members of the first unit to a secret mission which eventually leads to the discovery of a human-like Aragami named Shio. As they keep Shio a secret from the Director and teach her how to be human, the first unit is sent to search for Lindow's armlet after reports of his armlet sending off signals. After retrieving his Armlet, Sakuya then discovers Lindow was secretly investigating Johannes' secret project, called the Ark Project. Sakuya and Alisa's further investigation into the Ark Project led them to Aegis Island where the Aegis Project is held. Director Johannes caught the two and reveals to them that the Aegis project was a ruse for the Ark Project. Ark Project's goal is to awaken an apocalyptic Aragami known as "Nova" to destroy all life on earth and saving a chosen 1000 by sending them into outer space in arks. Alongside Johannes, Alisa's therapist attempts to hypnotize Alisa into fighting Sakuya, however, she overcomes it and the two escape. The two manage to make contact with the Protagonist and the rest of the first unit to inform them of the Ark Project and decide whether they'll support the Ark Project or not. Kota decides to support Ark Project to protect his family. When the invitation to join the Ark Project is given to the Protagonist by the Director, the Protagonist prolongs an answer. Protagonist decides to checks on Sakaki and Shio, but a power outage devised by the Director occurred. The Director discovered Sakaki was holding Shio, who was the singularity, and takes her by force. Alisa and Sakuya rejoin the members of the first unit after discovering that the Ark Project was close to completion. Kota, after discovering Shio was missing, decides to help the others and discovered a secret route to enter into Aegis Island. The group reach Aegis Island to retrieve Shio but arrive too late. The Director had already extracted Shio's core and placed it within Nova. Director Johannes fuses with Aragami in efforts to stopping the team from stopping Nova's awakening. The team successfully defeats Johannes but Nova has already begun to awaken. Director Johannes urges the team to go into an Ark before it’s too late and that he was never going to enter an ark. As the group is dismayed for failing, Shio miraculously awaken and decides to take Nova to the moon in order to protect the planet. Shio gives farewell to the team and departs. Gods Eater Burst continues the story three months after. First Unit encounter a new-type Aragami that leaves the Protagonist's God Arc damaged. Upon getting the God Arc repaired, Far East Branch has been infiltrated by Aragami. The Protagonist finds an opportunity to use Lindow's God Arc but is warned by Licca, the engineer, that it is impossible to wield someone else's God Arc as the God Arc would reject the foreign God Eater. The Protagonist attempts to wield it regardless of the warning and experience Resonance through Lindow's God Arc, revealing that Lindow is still alive. Before falling unconscious, the Protagonist is saved from an Aragami by a new God Eater. The God Eater introduces themselves as Ren who used to work with Lindow. The Protagonist informs Sakaki and Tsubaki of Lindow's whereabouts, causing them to reopen the search for Lindow. Ren explains to the Protagonist that once a God Eater has lost their armlet they eventually turn into Aragami themselves and can only be killed by their own God Arc. During the search for Lindow, The protagonist reencounters the new-type Aragami. The Protagonist experiences Resonance with the new-type revealing that he is actually Lindow. Protagonist decides to face Lindow alone in Aegis Island but the rest of First Unit discover his intentions and join him in an effort to rescuing Lindow. Ren also joins and offers Lindow's God Arc so that the Protagonist may defeat Lindow. The Protagonist then quotes Lindow's order to not die and uses Resonance to enter Lindow's mind with Ren and free him from the Aragami. During their battle within the Aragami, Ren reveals that he is actually a projection of Lindow's God Arc and sacrifices himself to defeat the Aragami. Once defeated, Lindow returns to his human form and returns to Far East Branch. Some time passed and Lindow had married Sakuya and training New-type God Eaters. God Eater Resurrection adds an additional story arc after the events of Burst. A new Aragami, remnant of Nova, Arius Nova has appeared, having devoured various type of Bias Factor until it was eventually discovered the monster became highly resistant against the God Arcs due to them not being "satisfied" by the taste of Arius Nova, having similar components of the Outer Wall of Fenrir's far east branch. This led to the eventual fight between First Unit team, which ended in their victory but they discovered that the Aragami wasn't dead, rather simply faking it and escaping afterwards. After that all of 3 units began the search for Arius Nova anew, eventually leading to another encounter but in which first unit team (Protagonist, Soma, Alisa, Kota) were all defeated by seemingly stronger Arius Nova, at one point the Aragami was about to finish off the Protagonist but the arrival of an Aragami looking like Shio from the first story arc stopped this from happening. After the battle the protagonist is tasked with defeated specific monsters to purge Arius Nova Bias Factor cells from his/hers injured comrades, via the materials collected from slain monsters, being notified by other members and Fenrir itself of sightings of the white 10 year old looking female (Shio) throughout various locations during a chain of quests. After his comrades fully recovered professor Sakaki and Licca come up with a theory on how to beat Arius Nova which involves fighting a new type of various Aragami, which didn't appear in the game so far, and old but much stronger ones classified as "Dreadnought" class, to collect their core, these rare Aragami have been powered by pieces of Nova, and are extremely lethal, but they're very rare and if God Arcs devour them they might have a chance against Arius Nova. During the hunt on Dreadnought class Aragami the team encounters various apparitions of Shio, and thanks to the Resonance ability they see various events that happened to her before and during God Eater story arc. After the encounter with newly discovered blitz Hannibal 1st Unit is informed of another Dreadnought class aragami, to which they rush right after the mission, but Nova arrives there first as the baits set up by Sakuya and Lindow didn't distract it from dreadnoughts, killing that aragami and devouring the core, then retreating. Thanks to the report of Kota, who shot the Aragami after it devoured the core it was found out that due to new bias factor introduced into its system for a small amount of time Arius Nova is vulnerable. Licca constructs every dreadnought core they had into one and on the night of full moon, closest to earth than in last 18 years the final fight begins with Arius Nova, in which every member of 1st unit participates (in cutscenes, not the mission itself, as usual that is limited to 4) including Sakuya and Lindow, defeating Arius Nova and saying their final goodbyes to Shio. This is also another of rare occasions where main protagonist speaks, first directing how the team should proceed with the final attack and then thanking Shio. Shio disappears, since she was still on the moon, thanking them for the memories in the epilogue. The player (プレイヤー, Pureiyā) is a new recruit on Far East Branch who is assigned as a member of the first unit of God Eaters. The player is also the first New-Type God Eater to join the Far East Branch. In various God Eater media, the male player's default name is revealed to be Yuu Kannagi (神薙 ユウ, Kannagi Yū) while in the anime adaptation, he is named as Lenka Utsugi (空木 レンカ, Utsugi Renka). Lenka is voiced by Ryuuichi Kijima in Japanese. Rindo Amamiya (雨宮 リンドウ, Amamiya Rindō, romanized as Lindow Amamiya in the anime version) is the leader of the first unit and boasts the highest survival rate (90%). His God Arc is an Old-Type Long Blade. Voiced by Kyle Hebert in English and by Hiroaki Hirata in Japanese. Soma Schicksal (ソーマ・シックザール, Sōma Shikkuzāru) is a member of the first unit who avoids interacting with others but have a high survival rate the same as Rindo too. He is also very strong and strangely can regenerate his wounds faster than any other human. His God Arc is an Old-Type Buster Blade. Voiced by Kazuya Nakai in Japanese. Sakuya Tachibana (橘 サクヤ, Tachibana Sakuya) is the sub-leader of the first unit. She is a top-rank shooter and her god arc is a sniper (old-type; long range)  Voiced by Michelle Ruff in English and by Sayaka Ohara in Japanese. Kota Fujiki (藤木 コウタ, Fujiki Kōta) is a member of the first unit who joins the God Eaters at the same time as the player. His god arc is an assault (old type; long range). Voiced by Daisuke Sakaguchi in Japanese. Alisa Ilynichna Omela (アリサ・イリーニチナ・アミエーラ, Arisa Irīnichina Amiēra) is the new-type recruit from the Russia branch who has a traumatic history with Aragami. Her god arc is Long Blade Assault (New type). Like the player, Alisa is also a New-Type. Voiced by Maaya Sakamoto in Japanese. Tsubaki Amamiya (雨宮 ツバキ, Amamiya Tsubaki) is Rindo's sister who also acts as a supervisor of the first, second, and third units. Voiced by Mary Elizabeth McGlynn in English and by Atsuko Tanaka in Japanese. Johannes von Schicksal (ヨハネス・フォン・シックザール) is the head of the Far Eastern branch of Fenrir, Anagura. With his soft demeanour, he excels in political negotiating between the various branches. He is also the Father of Soma. Voiced by Rikiya Koyama in Japanese. Hibari Takeda (竹田 ヒバリ, Takeda Hibari) is a Far East Branch operator, mainly in charge of taking orders for missions and processing rewards. Despite being on the list of Possible Matches for Gods Eaters, she has yet to find a bias factor with a high enough compatibility rate. Voiced by Kanae Itō in Japanese. Paylor Sakaki (ペイラー・榊) is a founding member of Fenrir and current Chief Supervisor of its Far East Branch's Aragami Technology Department. He is the one who discovered the Bias Factor. Voiced by Taiten Kusunoki in Japanese. Aisha Gauche (アイーシャ・ゴーシュ) is a founding member of Fenrir and Chief of Aragami Research Lab as well as the deceased wife of Johannes von Schicksal, and the mother of Soma Schicksal. Voiced by Rica Fukami in Japanese. Licca Kusunoki (楠 リッカ, Kusonoki Rikka) a female mechanic of the God Arc Maintenance Crew. Voiced by Chiaki Omigawa in Japanese. Tatsumi O'Mori (大森 タツミ, Oomori Tatsumi) a member of the 2nd Unit and leader of the Defense Unit. When not in duty, he's frequently seen hitting on Hibari at her counter. His god arc is a Short Blade (old-type). Voiced by Takeshi Mori in Japanese. The game was directed by Yoshimura Hiro, produced by Yosuke Tomizawa. Character designs were provided by Koichi Itakura and Sokabe Shuji. God Eater was initially announced on July 9, 2009 by Namco Bandai Games. Shortly after the game's Japanese release a North American release was announced by a subsidiary of Namco Bandai Holdings, D3 Publisher, for a Q3 2010 release. However, D3 announced that it would be delayed to sometime in 2011. Namco Bandai teased a new God Eater project with an event known as God Eater Fes 2010 which was scheduled to take place in Akiba Square on July 11, 2010. However, five days prior to the event, Famitsu revealed God Eater Burst, an "evolved" version of the original God Eater. The game was confirmed to contain additional arms, a new story, characters, enemies along with rebalanced gameplay and brushed up graphics. God Eater Burst was released in Japan in October 28, 2010 alongside an expansion pack God Eater Burst: Append Edition adding all the new content of GEB to the original GE game. On January 12, 2011 it was revealed that the North American title would be changed to Gods Eater Burst making the word God plural. In addition to the main story arc featured in the original, Gods Eater Burst features an added storyline not featured in the original Japanese release. There is a sequel to the game entitled God Eater 2 on Famitsu, set two years after the first game. The game's first trailer was released July 21, 2012 during the annual gaming convention Tokyo Game show. It was released on November 14, 2013. Several light novel series adaptations have been released. The first novel series was written by Yuurikin, illustrated by Sokabe Shuji, published by Enterbrain and serialized in Famitsu Bunko magazine. The chapters were compiled into a single volume and released on June 30, 2010 under the title God Eater: Kinki o yaburu mono (ゴッドイーター 禁忌を破る者, God Eater: Those Who Break the Taboo). The second is made up of two-volumes: God Eater: Alisa in Underworld (GOD EATER ～アリサ・イン・アンダーワールド～) and God Eater: Knockin 'On Heaven's Door (GOD EATER ～ノッキン・オン・ヘブンズドア～). They were written by Ryuzaki Tsukasa, illustrated by Sokabe Shuji, and published by Kadokawa Shoten. The novels were released on September 18, 2010 and December 18, 2010 respectively. The game had also received several manga adaptations written by Namco Bandai. The first is titled God Eater: Kyūseishu no Kikan (GOD EATER -救世主の帰還-, God Eater -Return of the Messaiah-) was illustrated by Osan Eijii, published by Kodansha, and serialized in Rival Comics magazine. As of December 28, 2011, the series was completed and compiled into five volumes. The second is titled God Eater: the spiral fate and was illustrated by Saito Rokuro, published by Dengeki Comics and serialized in Side-B.N Magazine. As of November 27, 2010, the manga was completed and compiled into two volumes. A third manga titled God Eater: the summer wars was illustrated by Okiura, published by Kadokawa Shoten and serialized in Dragon Age Comics Magazine. The series was completed and compiled into a single volume on May 7, 2012. A twelve-minute prequel original video animation was made by Ufotable and aired on September 28, 2009. In September 2014, an anime television series also produced by Ufotable, was announced. The series is directed by Takayuki Hirao with character designs by Keita Shimizu. The anime began airing on July 12, 2015, after the first episode was delayed by a week due to production issues. Due to the popularity of the anime and most of its fanbase not knowing about the video game series, it is often confused that the game God Eater Resurrection is based off the anime, when in reality the anime is based on the video game. The official God Eater Burst Drama and Original Soundtrack (GOD EATER BURST ドラマ&オリジナル・サウンドトラック) was released on a single disc on December 22, 2010. It was composed by Go Shiina and featured the game's opening and ending theme songs, "Over the Clouds" and "My Life", both of which are sung by Alan. A trading card game was released as [God Eater Burst] Monster Collection Trading Card Game in September 2011. Two 50-card decks were released as God Eater Burst - God Eater and God Eater Burst - Aragami that included special dice, a reference sheet, and a play mat. A set of nine miniatures featuring the Aragami was released in Japan as Soul of Figuration God Eater. A cell phone game spin off titled, God Eater Mobile was developed by Mobage and released on December 16, 2010 in Japan for the i-Mode, EZWeb, and Yahoo! Keitai distribution service. Similar to the original PSP game, it features character customization, item purchasing and hunting Aragami. The game received mixed reviews, with a 71/100 on Metacritic. The game scored well in Japanese gaming magazine Famitsu, which gave a total score of 34 out of 40(9/9/8/8). The original God Eater sold 295,000 copies in the first week of its Japanese release, and by March 2011 God Eater had sold over 610,000 copies in Japan. The re-release version, God Eater Burst, sold 263,150 copies within the first week of release in Japan. The 2015 remake, God Eater Resurrection, sold a total of 167,857 copies across both PlayStation Vita and PlayStation 4 platforms within the first week of release in Japan; the majority of copies sold involved the Vita version, which took the top position within the Japanese software sales charts for that particular week. ^ a b c John Tanaka (July 1, 2009). "Eat Gods on your PSP". IGN. Retrieved April 18, 2010. ^ "God Eater Resurrection Japanese release date set, debut trailer". Gematsu. Retrieved 2015-12-24. ^ a b c Michael McWhertor (February 23, 2010). "God Eater's Brand Of Divine Hack 'n' Slash Action Coming To America". Kotaku. Retrieved April 18, 2010. ^ a b c d Matt Edwards (2011-03-31). "Eurogamer Gods Eater Burst review". Eurogamer. Retrieved 2012-07-18. ^ a b Clements, Ryan (2011-02-28). "Gods Eater Burst Review - Eating gods is a tough job, but somebody's gotta' do it". IGN. Retrieved 2012-07-18. ^ a b c d e Shift. Gods Eater Burst. Namco Bandai Games. ^ Shift. Gods Eater Burst. Namco Bandai Games. Scene: Soma & Kota 1. Kota: Hey! Soma! I've been thinking we should throw a party for our new leader here on our next day off - are you in? / Soma: No thanks. / Kota: Oh come on, don't be like that... / Soma: Go ahead and have your little love fest.. just leave me out of it. (Jump from ruined house) [...] / [after Kota blame Soma from far] / Kota: Jezz! I'm just trying to... That guy is too anti-social. ^ Shift. Gods Eater Burst. Namco Bandai Games. Scene: Another New-Type. Rindo: What a promising rookie... We've got to be the only branch with two of these rare New-Types! / Tsubaki: Yes, I suppose so. But we'll be stepping up the search for New-Types matches from now on... HQ's new policy. The thing is, this girl maybe a match, but she's also somewhat mentally unstable. ^ "ハイスピードハンティングゲーム『GOD EATER（ゴッドイーター）』がPSPで登場". Famitsu. 2009-07-16. Retrieved January 22, 2014. ^ Spencer (2010-06-16). "God Eater Hit With Indigestion, Delayed Until Next Year". Siliconera. Retrieved January 22, 2014. ^ Spencer (2010-03-27). "Namco Bandai Teases Next God Eater Project". Siliconera. Retrieved January 22, 2014. ^ Spencer (2010-07-06). "God Eater Burst Confirmed For PSP [Update]". Siliconera. Retrieved January 22, 2014. ^ Ishaan (2011-01-12). "God Eater Burst Has A New Name In North America". Siliconera. Retrieved January 16, 2011. ^ Alex Fuller (2011-02-14). "Gods Eater Burst – Staff Review. "Nutritional Results May Vary."". RPGamer. Retrieved January 22, 2013. ^ Sam Marchello. "Namco Bandai Announces God Eater 2". RPGamer. Retrieved 2012-07-11. ^ ゴッドイーター　禁忌を破る者 (in Japanese). Enterbrain. Retrieved January 28, 2014. ^ "GOD EATER ～アリサ・イン・アンダーワールド～" (in Japanese). Kadokawa Shoten. Retrieved January 22, 2014. ^ "GOD EATER ～ノッキン・オン・ヘブンズドア～" (in Japanese). Kadokawa Shoten. Retrieved January 22, 2014. ^ "GOD EATER　−救世主の帰還−（5）＜完＞" (in Japanese). Kodansha. Retrieved January 22, 2014. ^ "GOD EATER（2） -the spiral fate-" (in Japanese). Dengeki Comics. Retrieved January 22, 2014. ^ "GOD EATER the summer wars" (in Japanese). Kadokawa Shoten. Retrieved January 22, 2014. ^ "Watch The Animated Gods Eater Burst Prequel (In English!)". Siliconera. February 22, 2011. ^ "The Garden of Sinners' Hirao Directs God Eater Anime". Anime News Network. October 12, 2014. Retrieved July 13, 2015. ^ "God Eater Anime's 1st Episode Delayed, Replaced with Special". Anime News Network. July 1, 2015. Retrieved July 13, 2015. ^ "GOD EATER BURST Drama & Original Soundtrack". VG Tunes. Retrieved July 6, 2012. ^ "人気ACT『ゴッドイーター』が出荷50万本をハイスピード突破". ASCII Media Works (in Japanese). Dengeki Online. February 24, 2010. Retrieved May 29, 2010. ^ "『GOD EATER MOBILE』がモバゲーで配信開始" (in Japanese). Famitsu. Retrieved January 22, 2014. ^ a b "Gods Eater Burst for PSP Reviews". Metacritic. CBS Interactive. Retrieved 2018-09-20. ^ "God Eater Resurrection for PlayStation 4 Reviews". Metacritic. CBS Interactive. Retrieved 2018-09-20. ^ "Gods Eater Burst Review". Edge Magazine. March 2011: 103. ^ a b "Famitsu review scores". Nintendo Everything. January 26, 2010. Archived from the original on April 3, 2010. Retrieved April 18, 2010. ^ "GOD EATER RESURRECTION（ゴッドイーター リザレクション） レビュー・評価・感想 (PS4)". Famitsu. Enterbrain. Retrieved February 12, 2019. ^ "GOD EATER RESURRECTION（ゴッドイーター リザレクション） レビュー・評価・感想 (PS Vita)". Famitsu. Enterbrain. Retrieved February 12, 2019. ^ Kevin VanOrd (2011-02-28). "GameSpot Gods Eater Burst Review". GameSpot. Archived from the original on 2012-04-20. Retrieved 2012-07-18. ^ Anoop Gantayat (February 12, 2010). "Japan Gaga for god Eater". IGN. Retrieved April 18, 2010. ^ "Financial Highlights for the Fiscal Year Ended March 2010" (PDF) (Press release). Namco Bandai. May 7, 2010. Retrieved August 31, 2010. ^ "God Eater 2 in 2012 for Sony PSP". Senpai Gamer. 28 September 2011. Archived from the original on 3 May 2012. Retrieved 28 September 2011. ^ "God Eater 2 The first information pack". Senpai Gamer. 29 September 2011. Archived from the original on 2 April 2012. Retrieved 29 September 2011. ^ "Media Create Sales: 10/26/15 – 11/1/15". Gematsu. Retrieved 2015-12-24. This page was last edited on 10 April 2019, at 14:27 (UTC).